The Ascent of Mount Carmel: Book One The Active Night of the Senses — The Contemplative Life. According to St. John, to truly advance toward union with God the soul must pass through several "dark nights." He often speaks of the whole spiritual journey, the path from ordinary selfhood to union with God, as one long dark night. And yet there are nights within that Night. Book One of The Ascent concerns the first night – the Active Night of the Senses. In the Active Night of the Senses, the soul must purposefully deny itself of all attachments to the "things of the world" or its "appetites." Whether it is a desire for sensory pleasure, or attachment to a certain person, object, conception of ourselves, or way of living, the things we normally look to for satisfaction in the world must be denied. This mortification must take place not because the things themselves are bad, but because our attachment to them, according to St. John, hinders our journey toward union with God. "Hence, we call this nakedness a night for the soul, for we are not discussing the mere lack of things; this lack will not divest the soul if it craves for all these objects. We are dealing with the denudation of the soul's appetites and gratifications. This is what leaves it free and empty of all things, even though it possesses them. Since the things of the world cannot enter the soul, they are not in themselves an encumbrance or harm to it; rather, it is the will and appetite dwelling within that cause the damage when set on these things." For St. John, this absolute denial of all our appetites is a prerequisite to union with God. There is no way around it. "...for in God, or in the state of perfection, all appetites cease. The road and ascent to God, then, necessarily demands a habitual effort to renounce and mortify the appetites; the sooner this mortification is achieved, the sooner the soul reaches the top. But until the appetites are eliminated, one will not arrive no matter how much virtue is practiced. "The attainment of our goal demands that we never stop on this road, which means we must continually get rid of our wants rather than indulging them. For if we do not get rid of them all completely, we will not wholly reach our goal." Reminiscent of the teachings of Buddhism, desire/attachment/craving for things is ultimately seen as counterproductive, for the things we crave don't ultimately satisfy. "...it is plain that the appetites are wearisome and tiring. They resemble little children, restless and hard to please, always whining to their mother for this thing or that, and never satisfied. Just as anyone who digs covetously for a treasure grows tired and exhausted, so does anyone who strives to satisfy the appetites' demands become wearied and fatigued. And even if a soul does finally fill them, it is always weary because it is never satisfied. For, after all, one digs leaking cisterns that cannot contain the water that slakes thirst." "1. Have the habitual desire to imitate Christ in all your deeds by brining your life into conformity with his. 2. In order to be successful in this imitation, renounce and remain empty of any sensory satisfaction that is not purely for the honor and glory of God." not to wanting something, but to wanting nothing." 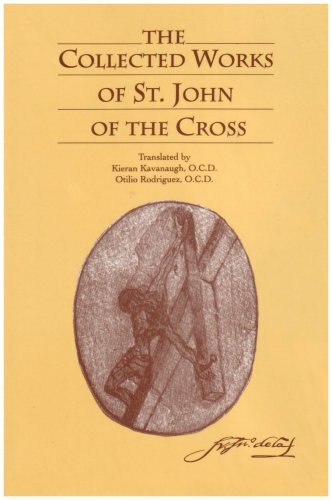 Finally, to end Book One, St. John returns to his poem and concludes that it ultimately takes a love of God, a stronger love than our love for our attachments in the world, in order to carry us through this first night. "The soul, then, states that 'fired with love's urgent longings' it passed through this night of sense to union with the Beloved. A love of pleasure, and attachment to it, usually fires the will toward the enjoyment of things that give pleasure. A more intense enkindling of another, better love (love of the soul's Bridegroom) is necessary for the vanquishing of the appetites and the denial of this pleasure. By finding satisfaction and strength in this love, it will have the courage and constancy to readily deny all other appetites." I struggle with this, especially as a non-monk who regularly interacts with family, friends...a significant other. It makes sense to me that attachment to our own pleasure keeps us bound to the things that give us that pleasure. We then remain chained, slaves to those things. We need them. In Hindu terms, we remain in Samsara. So, I see the logic. Regardless, in St. John's system, and in most contemplative paths, complete non-attachment from our appetites is necessary for total union with God. And this is the concern of Book One in The Ascent of Mount Carmel.